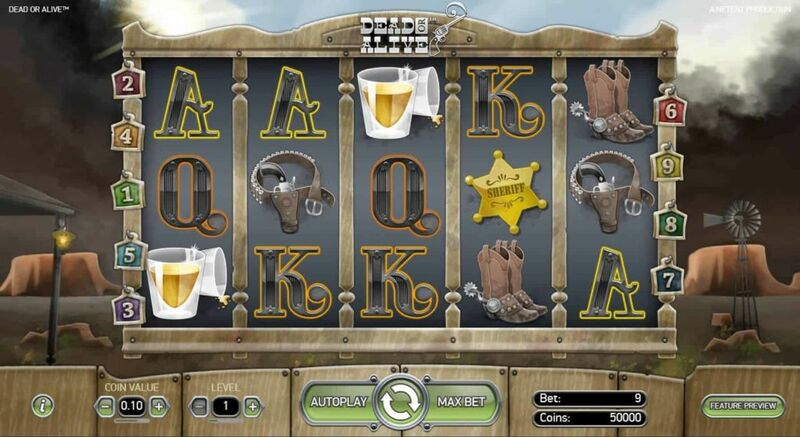 This Western-themed title was released in 2009 for both mobile and desktop players, and has been one of the most played and loved Net Entertainment slots since then. NetEnt’s Dead or Alive slot is often the preferred choice during our casino streamers live play sessions on both Twitch and YouTube. Thus, it’s also often the source of many of our DOA Big Win clips featured in our weekly “Big Wins”-compilations which you’ll find on the CasinoGrounds YouTube channel. Two great examples of a super big win on the doa netent title is LetsGiveItASpin’s 41.897 SEK win on a 9 kr bet, thanks to a Wild Line, as well as CasinoReggie’s 61.842 SEK win too on his 27 kr bet. Did anyone say high limit slot machines? The theme in Dead or Alive is very easy to spot from the first minute you open the game. We find five main characters, which all play an important part during the main game and free-spins. The reels are presented on something that can remind of a billboard in a western bar. The background changes every now and then, to be anything from a rainy night in the wild west to a fun evening at one of the local watering holes. There’s no background music in this game. What we can hear is the sounds of spins and winnings, and maybe a dog barking in the distance every now and then. As previously mentioned, the higher paying symbols play an important role in Dead or Alive. The wanted sign comes in five different flavors and all acts as a wild. During the free-spins, which are earned by landing scatter symbols, the wilds changes and add extra features to the bonus rounds. All winnings are paid out with a 2x multiplier. *Sticky Wilds hold their position during the whole free-spin session. *When all reels have at least one wild, you are granted five extra spins. You keep the sticky wilds, even through the re-spins. Note: You can only re-trigger once per free-spin session, giving a maximum potential of 17 free-spins. Although Dead or Alive is on the somewhat low in features category, I still really enjoyed my session at this somewhat classic video slot when I played it today. With very non-intrusive background sound, and nicely animated symbols, and a fairly high frequency of the wilds, I did get a bang for the buck so to speak when doing my review. I got to the free-spins a couple of times and was holding my breath pushing four wilds, and one spin left, hoping to get that bloody re-trigger just to be able to score that fine Dead or Alive big win, to no avail. Guess I’ll get them all next time. Kim loves the game, and his YouTube profile-picture really shows off his affection to the game as well. 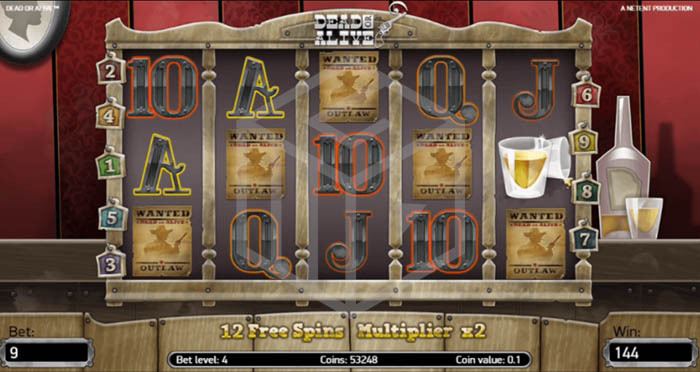 You can give the game a spin for free by trying the demo at the very top of our Dead or Alive slot review, or you can try it for real money at our streamers top rated casinos.